Congratulations to Justine Mejak of Cheektowaga! 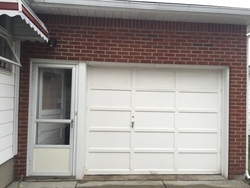 She just won a brand new Clopay Garage Door from Hamburg Overhead Door! She is thrilled! Thank you to everyone who participated and voted in this years contest. We look forward to doing it again next year! I'm a single, hard working, full time graduate student, 3-job working homeowner going through tough financial times. I should win because my garage door no longer opens well. It's rusted and gets stuck on the track. I can't use the handle to open it and I don't have the key for it. I live in a nice little neighborhood but my windows and doors make my house look like the worst on the block. 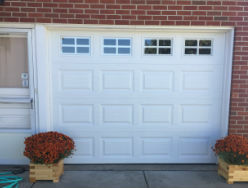 Having a new garage door would drastically help relieve the financial stress of having to buy a new door when it completely breaks. Please help me, Hamburg Overhead Door!